Shopping is a fun outing with the Rollz Flex rollator. This pliable, light weight rollator offers support for both you and all the things you would like to carry along. Its unique design makes it a rollator-in-disguise, one you happily show to others. The bag holds all of your errands, but wait, there’s more: put your coat in it, your umbrella, a bottle of water for when you’re on your way. Also that novel you’re reading: the Rollz Flex will remain stable even when fully loaded. This rollator lets you go about, go out and go further AND farther. The Rollz Flex bag is made out of sustainable and waterproof material: bright purple and denim grey. In rollator-position the Rollz Flex is a fully TÜV certified rollator. 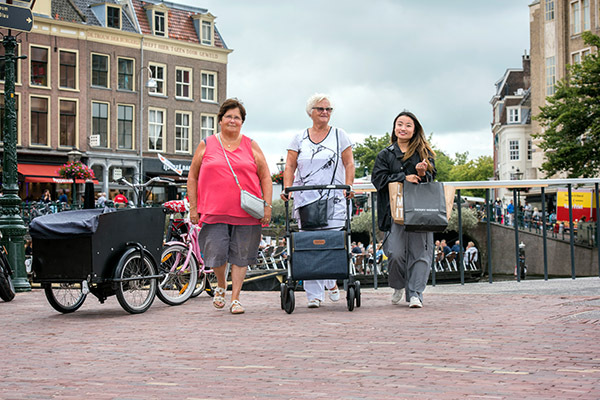 * Note: the Rollz Flex available in the USA and Canada is slightly different: it is delivered in fixed rollator position and with classic brakes only. Please contact our distributor Triumph Mobility for more information. * Note: the Rollz Flex Small available in the USA and Canada is slightly different: it is delivered in fixed rollator position and with classic brakes only. Please contact our distributor Triumph Mobility for more information. The Rollz Flex* is also available in a smaller version as from mid June 2018. This Rollz Flex Small rollator is designed for people with a body length of 1.40-1.60 m and is agile and stable, light and compact, just like the regular version. The small version is about four inches or ten centimeters lower, compared to the standard Rollz Flex. The handlebar of this smaller version is adjustable in five height positions. The bag is adjusted to the smaller size of the frame. The small version is equipped with classic brakes. The versatile Rollz Flex rollator allows you to go out or go shopping in a comfortable, stable way while being in style. The adjustable handlebar caters to your needs as regards stability and convenience: upright position or facing forward for even more stability. The large bag is your shopping companion. Manoeuvring is a breeze, even with a full bag. The classic brakes allow you to brake controlled and gradually while walking. The streamlined flip brakes are used to put the Rollz Flex rollator on the handbrake. So you can take a safe rest on the seat, secured by the handlebar in your back. The Rollz Flex is very manoeuverable due to its short turning radius: handling curves and corners is easier because of the short wheelbase. Pivoting is much easier as you will be able to hold your rollator close, offering support even while rounding a corner. The best thing about this: your Rollz Flex stays manoeuverable, even with a fully loaded bag. It's up to you: flip brakes or classical brakes. gradual braking & safe parking under any circumstances. The push bar has an adjustable height. running errands or as a rollator, as depicted. because of it's compact dimensions. seizing obstacles. Even with a full bag. the push bar acts like a backsupport. your bag is fully loaded! The frame of the Rollz Flex rollator always comes in white. The bag however is available in two colours (mixed fabric): either bright purple or denim grey. The Rollz Flex bag is made out of sustainable and waterproof material. The front side has reflective lines — you are visible, even when it’s getting darker. Need to bring extra bags along? Or do you use a walking stick as well? Rollz has developed shopping hooks and a cane holder. These items will enable you to take bags or a cane along. Rollz users tell all about the changes in their lives once starting to use a rollator. Do send us your own experiences.